The sweetness of the squash, fragrance of the sage and creaminess of ricotta are a divine match. The flavours need very little to bring the best out of them so keep the ingredients as simple as possible so you can taste each element. The secret twist to the creamy ricotta filling is a good helping of sweet roasted garlic which really takes it to another level. Ovenproof dishes come in such a range of shapes and size so, before you cook the lasagne sheets, try to work out how many sheets you need to fit yours. I always cook a couple of extra sheets in case they tear. The filling also works with cannelloni. 1. Get going by preheating the oven to 180c/ 160fan. Place the cubes of squash on a baking tray, drizzle with olive oil and season well with salt and pepper. Toss the cubes and add in the garlic cloves so each is coated in the oil and roast until tender. When it is ready, a knife will easily sink through the cubes. Place in a large bowl and set aside. 2. Whilst the squash is roasting you can get started on the béchamel sauce. Secure the bay leaves to the onion halves using the cloves- this way you don’t have to go fishing around the saucepan to find the cloves later on! Add the milk to a small pan and bring to a boil before removing from the heat and allowing the flavours from the bay and clove to infuse for around 20 minutes. Take another pan and melt the butter and flour together until a paste, or roux, is formed. Remove the onion, clove and bay from the pan containing the milk and slowly add the milk to the pan with the roux. Keep stirring so lumps don’t form! Simmer and stir until it thickens before removing it from the heat ready to pour over the lasagne. 3. Stir the ricotta through the squash cubes so well combined. Finely chop the fresh sage and add to the bowl along with 1tsp of ground nutmeg; use fresh nutmeg if you can. Taste and adjust the seasoning to suit you. Set the mixture aside whilst you prepare the lasagne sheets. Don’t worry if the squash starts to break up; I sometimes mash down half of the squash and leave the other half in cubes to add a different texture and make smoother. Squeeze the tender roasted garlic from their skins and mix through well. 4. Bring a large saucepan of water to the boil and add the lasagne sheets to cook, a few at a time so the pan does not become overcrowded. Cook the sheets until parboiled- you can cook them without parboiling but I think this really does make a difference. Nobody wants to find chewy pasta in their mouthful! 5. Now to assemble the lasagne. I spoon a little of the béchamel sauce in the bottom of the ovenproof dish to stop the pasta sticking when baked. Lay sheets of lasagne to cover the bottom before adding a layer of the butternut squash filling. Add another layer of pasta and repeat until the filling has been used up and finish with a layer of pasta. 6. Pour the béchamel sauce over the lasagne and top with freshly grated parmesan. Bake in the oven for 25-30 minutes until bubbling and golden. I usually cover the lasagne for the first half of the cooking time and then remove the foil for the end but it will depend on your oven as to if you need to do this or not. Serve with a simple side salad and dig in! 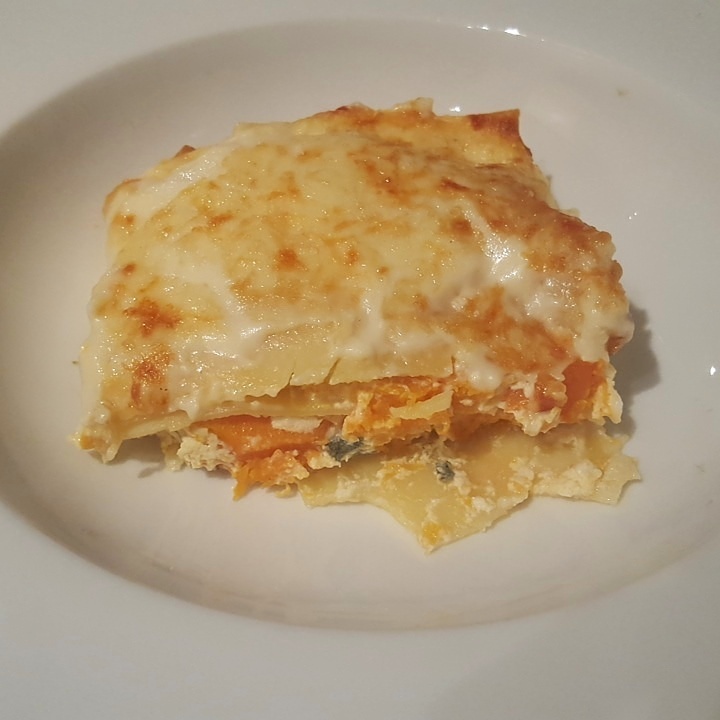 Squash, sage and ricotta lasagne- a satisfying vegetarian pasta dish which is perfect for a midweek meal or special occasion!